THE WRITING BUDDHA - Opinions | Books | Movies: Mrs Funnybones by Twinkle Khanna (Book Review-3*/5) !!! Mrs Funnybones by Twinkle Khanna (Book Review-3*/5) !!! I finished reading Twinkle Khanna's debut non-fiction book "Mrs Funnybones" within 2.5 hours. It belongs to humour genre and as she is already famous with her columns in newspaper and tweets, her regular readers will surely enjoy the way she have written this book. Frankly speaking, I have never read any of her columns except few tweets so I picked it up just as a random reader. She has basically shared how her usual days are and have tried to create humor through that. Sometimes the humour looks real and obvious while somethings it looks forced. Which I must say also acts as a drawback to this book. When you attempt something like humor genre and only half of your jokes are funny, the other half irritates the reader more than the former half which made him laugh out loud. 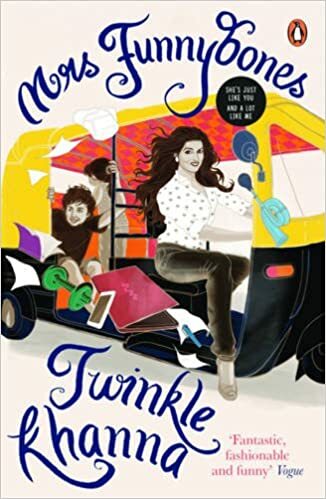 Twinkle Khanna have used a very easy language to write this book which makes it easy for the readers to understand what she is trying to put forward. The book starts about her life as a wife of a celebrity and later on moves on towards her daily routine with her children, husband, mother, mother-in-law etc. She discusses how a woman is in trouble throughout the day and with it, creates scenarios for us which are funny and laughable. She discusses even the serious issues so well that it does not look preachy and you like what she advises. Through her sarcasm, she is surely going to win many hearts but for me the book has been average. Yes, it has some worthy humour but as I said, because the equal number of jokes look forced and unwanted, she fails to make it a laugh riot. Just like her husband's recent movies which are of comedy genre but manages to make you laugh only 30% of times, this book also ends up giving almost similar performance. I, therefore, rate this book 3 stars out of 5.